Since our dog died, I have rarely walked along Kagamigawa River for about half a year. But for my health I decided to walk along the river after a long while, in addition to regular swimming. The woods of the shrine was reflected on the river and many wild ducks were seen swimming on the water, which had just begun to warm up. 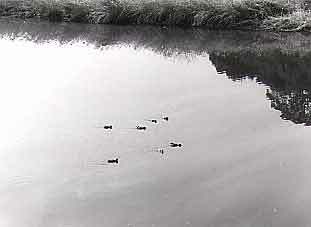 I wondered when those ducks had returned to the river. They seem to have language to communicate with each other. When they sense the presence of a dog or human, they sound a warning by making high-pitched "cheep cheep" and the whole flock move off in a neat formation. 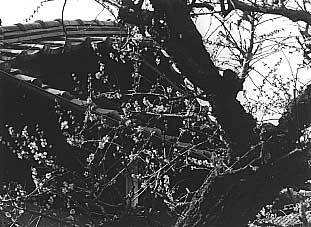 White plum flowers are blooming quietly near the eaves of houses, giving off a fragrance of early spring. The singing of Japanese bush warbler is not heard yet. The forecast was cloudy for tonight, but the clouds were present only for a short period of time in the early evening. The night was superb with the stars and moon. I rushed to the observatory and continued observation until around 3 o'clock in the morning. Luckily, the forecast was wrong by more than a half day. Comet McNaught-Hartley (1999 T1) has moved to the northern sky and was showing its beautiful pure-white disk glowing at 8.9 magnitude in the 20cm telescope. C/2001 A1 (LINEAR) has faded slightly. A photograph captured it at about 18th magnitude. I came to the observatory at midnight. Forty kilometers back in Kochi City, it was clear, but when I arrived at the observatory one hour later, a large band of white cloud formed from east to west. Seeing worsened, too, with a winter weather pattern setting in. Between clouds I photographed a number of faint comets. Comet Utsunomiya-Jones had faded suddenly; even the 60cm telescope was not able to capture it easily. However, McNaught-Hartley C/1999 T1 had moved to the northern sky showing its beautiful 8.5-magnitude disk. Perhaps R Coronae has risen but seems faint to the naked eye. M13 in Hercules is superb at zenith. 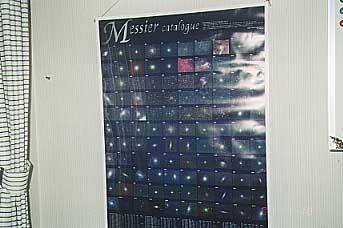 A poster of beautiful color photographs of all the 110 Messier objects has recently been published by the Astronomical Society of Japan. The poster was donated by Mr. Hirohisa Sato. It was placed in an aluminum frame and hung in the studio. It looks very pretty and is admired by visitors. Next to it is a 3ftx3ft color photograph of Comet Ikeya-Seki. As soon as February arrived, rainy days have increased. I saw patches of blue sky last night and came to the observatory. However, at the change of days at midnight clouds began to roll in and observation became impossible. The observatory is situated at a place called Wajiki. It is a basin surrounded by the Shikoku Mountains to the north, Yanagaresan Mountain in the east, and Teiyama Mountain in the west. And at midnight, all the lights in plastic-covered greenhouses are turned on. This generates heat, which rises and develops low-lying clouds. Giving up observing and driving back to the west, I always notice clear sky after passing a tunnel at Teiyama Mountain. This shows Geisei is not blessed with good weather. It was 1.50 am. Suddenly, a large fireball flew over a forest in the east. It was visible from the observatory in the cloudy sky for about 5 seconds 25 degrees above the horizon in the east-northeast. A fireball as bright as quarter moon fell from south to north. It must have been clearly seen in the Kinki area (northeast of Kochi). It was a white flash. Since the beginning of February, it has become a little warmer, but the weather hasn't been good. It was cloudy first and turned rain later today. In spite of this, six women from Geisei Village's Umanoue visited the observatory. With a presentation of slides, they learned the winter constellations and marveled at the mysterious winter Milky Way. They viewed Galaxies at the outer edge of the universe as seen by Subaru Telescope at a distance of 1.3 billion light-years. On clear nights visitors view the heavens through the telescope and no more, but on cloudy nights they will be presented with entertainments which they find more interesting. With visitors I was able to ponder on the universe and aliens only because it was cloudy. Our conclusion from tonight's discussion was that there are a lot of aliens. It was very cold all day today. About 10 primary school teachers gathered at the observatory and had an observing session. The colder, the prettier are the stars. Tonight's winter constellations were exceptional. Although there was some turbulence in the air, the rings of Saturn, the cloud bands of Jupiter and its moons were clearly seen. The Winter Triangle was magnificent. It was also the best time to see Canopus in the evening. Someone shouted with excitement "I can see Canopus!" 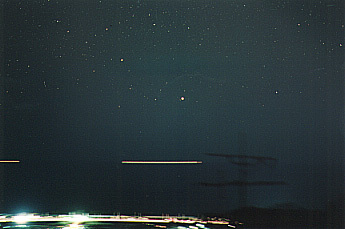 The photograph, as seen from the observatory, shows National Highway 55, lights of fishing boats near the horizon, and the giant star Canopus floating above them. The photograph was taken by an 85mm f/2 lens with an approximately 10-minute exposure. Please note faint stars around Canopus are visible. I like the month of Kisaragi (February in the lunar calendar). Spring is still far away, but I feel a delicate softness in sunlight and there will be more spring-like, windless mild days. However, the winter constellations still dictate the night sky and Orion tossed around in turbulent air is seen through trees. It is a typical sight of early spring. The Large Dog rising above the horizon, whose howling is heard in the distance, and the Little Dog playful with the Large Dog in the air... .The Winter Triangle is at its best. I looked at the Trapezium in the Great Orion Nebula through the 20cm refractor. 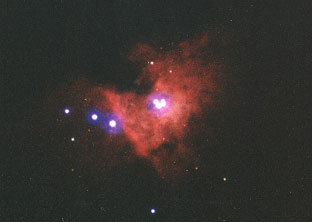 At 50X it was split into magnificent 4 stars, but they will be blurred and unresolved in poor-quality optics. The Trapezium is not discernible in photographs swallowed by the glow of the nebula, but a 10-second short exposure brings out its glow magifincently.